Their fans took an old Al Jolson song and they made it their own. They said they’d walk a million miles for one of their smiles… Miami. They adored the band with their fresh repertoire, their smiles and their moves. In particular, they lit on the singer Fran O’Toole, the boy from Bray whose vocals revealed a love for soul music and whose face was kind and gracious. He looked like the American star David Cassidy. The other band members were half-joking when they said that they were jealous. Onstage, it was all about the lightness but it was also a serious business. There were set codes of behavior, about talking to their audience after a gig, about how to answer fan mail, about good behaviour in public. They had their own hairdresser. Their manager, Tom Doherty from Topline Promotions even sent the Miami Showband’s brass players to dance classes, encouraging them to move it like the Four Tops and to swing and dip their instruments, just so. At their prime, they travelled in a bespoke coach with a big palm tree on the side panel and a built-in wardrobe inside where they hung up their Louis Copeland suits. There was a reel-to-reel recorder that ran off a 12 volt battery and they used this to rehearse during the endless hauls across Ireland. Five or six nights a week and maybe another Dublin show at the TV Club in Dublin on a Monday, playing to their off-duty peers and to rockers like Phil Lynott. There were over 600 showbands in Ireland in the Sixties, playing up to four hours a night, packing the brass and a line-up that was still based on the Dixieland model. Around 1954 the Clipper Carlton from Strabane had dispensed with the sheet music and their seats, adding comedy skits and energy. A year later and Dave Glover was calling his combo a showband but it was the pure verve of Brendan Bowyer and the Royal from Waterford that defined the age. He crooned and he jumped. He threw shapes and he did the hucklebuck. The Dixies had made it out of Cork and so it was imperative that Dublin had its own stars. The Miami rehearsed in the Palm Beach Hotel in Portmarnock and in the late Sixties they were at the top of their game. Dickie Rock sang the ballads and Sinatra show tunes. Impassioned females would shout, “spit on me, Dickie”, happy to get the slightest recognition. Fran would play keyboards and favour the husky tones of Smokey Robinson and Wilson Pickett. Des Lee from Belfast sang pops and horn player Brian McCoy from Tyrone handled some of the country material. Three songs fast, three songs slow and then the same again. Two thousand people in the dancehalls many nights, simple rites of courtship and never the harm in it. 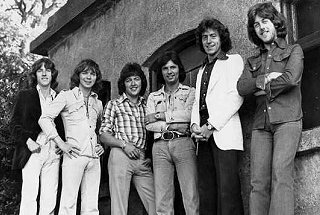 The Miami Showband Massacre happened around 2am on July 31, 1975. Three musicians were shot at point blank range on the way home from a gig. Fran was hit by 22 bullets, many of them in the head. Guitarist Tony Geraghty was shot five times in the back and twice in the back of the skull. The pattern of the bullet holes suggested that he had put his arms up for protection. There was also a bullet in his scrotum, fired from a revolver at close range. Brian McCoy was shot four times. They had asked their killers for mercy, but none was given. Two of the band members survived: Des was blown into a ditch and Stephen survived a dum-dum bullet that seared through his internal organs. These jobbing musicians with no involvement in the conflict had become targets. The paramilitaries had literally shot the piano player. Yet the UDR soldiers were also members of the mid Ulster UVF with links to the brutal Glenanne Gang. The latter’s territory was the murder triangle that extended from north Armagh to the border and west into Tyrone. They had decided to put a bomb in the back of the Miami’s van. At least ten pounds of commercial gelignite on a short fuse. The musicians would be killed in transit back to Dublin. The point of all this has never been made clear. Possibly it was intended to further destabilise Northern Ireland, to make border controls more rigid. Perhaps they wanted to make even the humble players look like they were transporting bombs, seemingly part of the armed struggle. Whatever, the mission failed. The bomb went off prematurely. Two of the paramilitaries were killed trying to hide the explosives in the van. One of these was later identified by a UVF tattoo on an arm fragment. In the original plan, the musicians would have all been killed in their VW van and there would have been no witnesses to the checkpoint and the bomb planting. With these new circumstances, it was quickly decided that Miami Showband should be dispatched with Sterling submachine guns and a Luger pistol. Des: “I remember as a child watching all the GI and Vietnam war movies. – you lie down, pretend you’re dead, hold your breath and that’s exactly what I did. That’s what probably saved my life. The ditch was on fire from the explosion and as the fire was coming very close to my body I realized that if I stayed here I’m gonna burn alive. So I had to run up the ditch not knowing was going on. Was I gonna get mowed down? Are they still around? Earlier, Des and Stephen had both stepped out of line at the roadside check, to make sure their instruments were safe and to reassure the military that nothing in the van was suspect. This was the saving of them. They changed places in the line when they returned, thus escaping the worst. And while they have been involved in other musical projects and different businesses since 1975, they also concede that they must keep telling their story. It’s an essential work of testimony. There is a monument to the band outside the National Ballroom on Parnell Square, Dublin. Friends of the band will gather there on August 1 to mark the 40th anniversary. There’s now a Fran O’Toole Bridge in Bray over the River Dargle and a plaque outside the singer’s old home nearby. On August 2, there will also be a meeting at the site of the massacre. Des insists that there should be proper recognition in the north. The book has been optioned by a Holywood producer and the second draft of the screenplay is complete. Pre-production is likely to begin later this year. Meantime Stephen visits conferences and gatherings at The Hague, in Amsterdam, Omagh and Spain. He doesn’t flinch from graphic content and feels that this is defensible. There is ongoing litigation against the Chief Constable of the PSNI and the Ministry of Defence. In the course of all this, Stephen was diagnosed with Enduring Personality Change, a syndrome that was first noted with survivors of concentration camps. He gave evidence at the Barron Tribunal in 1997. Both Stephen and Des are affronted that their testimony to British Army involvement in the massacre has not been reflected fully in the Historical Enquiries Team findings. Des believes that the British voice at the checkpoint was Captain Robert Nairac, later believed to have been executed by the IRA in County Armagh in 1977. This was also the view of MP Ken Livingstone, who named Nairac in Parliament in 1987 as being party to the Massacre. Stephen: “I’ve never said that it was or it wasn’t Nairac. The man that I saw appeared to have fair hair. I would never speculate like that. People have come forward – ex British army people – to the researchers from the film. They have given them information which has been followed up but I can’t say that …. If it’s not something that you can bring into court, I certainly wouldn’t put my name to it. I’m absolutely certain without a shadow of a doubt that there was a British army officer there. For some time after the massacre, Stephen had articulated a message of reconciliation and had affected a relatively normal demeanour. It was the 30th anniversary of the massacre that prompted a change. For the first time he began to regard himself as a victim, with the attendant trauma. The Massacre was widely reported and visiting musicians cancelled their shows. A gig by talent show star Lena Zavaroni was pulled by promoter Phil Solomon. For another promoter, Jim Aiken, it became a major challenge to retain international names. Charlie Pride, the country artist was in the ascendant and in 1975 Aiken had secured four dates from a 40 date UK package. However this was now in question. Charlie’s band was unwilling to play the dates and the anxieties were shared by his wife and the executives at RCA Records. Jim determined to make an arduous trip to Ohio to meet the singer backstage and to deliver the persuasion in person. Jim Aiken: “Suddenly we became a place not to go to. I wouldn’t say it was anti-northern. It was… we can do without the north. Every atrocity affects you in some way and some in a particular way. And this was a particular way because it was a business that I was in and we foolishly thought that we were immune and entertainers were immune because entertainers weren’t attacked in the world, or anything like that. We thought that bringing normality through music was the story. We told the people – come here, everything’s not right, but there’s music that people want to hear and that’s it. Eventually, a date at the Ritz Cinema in 1976 was confirmed and Aiken was in business again. The showband industry was in decline at this stage. Discos were providing cheap competition and now the northern market had become perilous. The bands were advised to cover up the logos on the side of their vans. It was the same for rock acts, although Rory Gallagher and a few bold exceptions would still play to appreciative audiences in the north. It was always a risk though, as Barry Devlin from Horslips remembers. Amidst the blackness, the talk of collusion and cover up, there is a proud realisation of the importance of music during the worst times. Stephen is emphatic.